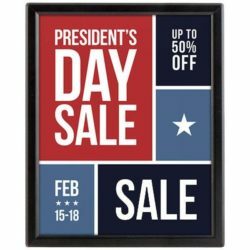 This swing sign is the best one that you need as its durable construction does not let you down even in windy or rainy weather. 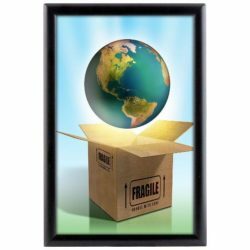 As it is resistant to outdoor weather conditions, we guarantee that your poster is actually protected. In addition to this, if time is important for you, you are in the right address because it is easy to be cleaned by just being wiped away by some cloth or a spong. 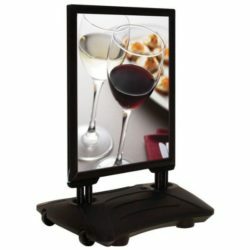 Moreover it can stand in moderate winds so you can use it any where for advertising your products especially in the competitive markets. 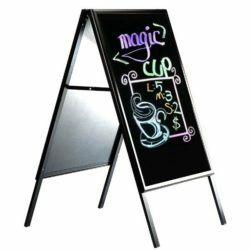 This display is also called as a sidewalk sign which is ideal and the number one to meet your requirements in different sectors especially in hospitability or service industries and in the retail. Standard base color is black. No matter indoors or outdoors, you can dispose it in any other place but for its advantage to be able to placed in so many different places areas. It will help you advertise your products and your company incessantly which means that you will be the winner side and will make a good profit by choosing this product. Not only this one but also our other products are in good quality. As you know, in today’s world, appearance is important in social behaviours that’s why we give so much importance to the designs of the products. This product is one of them so we are sure that its deluxe and elegant sytle in the construction of its fabrication will attract the attention and keep the costumer’s eyes on your publicity. So, your sale and profit proportions will augment as soon as you buy one. 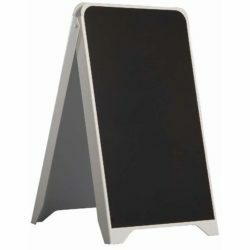 Another point presented by the display as a practical service in its design is to be mounted with the help of two rings included in these sandwich boards. In windy weathers or by accident, to prevent it failing off and to be able to supply its standing strong we have added double latching mechanism to each ring so thanks to this addition, its usage has become much more practical, useful and efficient than ever. With both straps open, fit the panel onto the straps, firmly grasp the sign frame and oust the strap sideways to close. We guarantee that you will be pleased by preferring and choosing us because we have used a high quality of plastic in the fabrication of this and the other products. 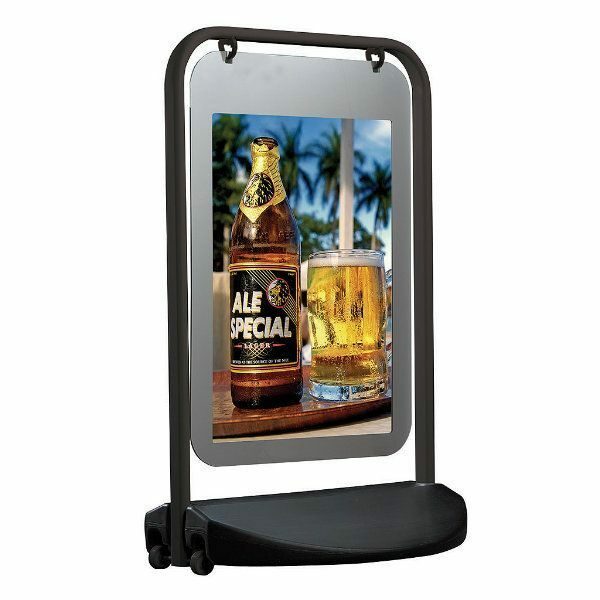 Additionally, in-built wheels and magnetic edged poster wallet provide weather resistance in outdoor positioning. We believe that with all these advantages, we will provide you convenience and pleasure. Not only posters but also banners, brochures, sidewalk signs or messages, could be inserted into them to supply the communication between your target audience and you. With the help of its practical structure, it can be used in so different and diversified areas and gives you the chance to access your costumers.